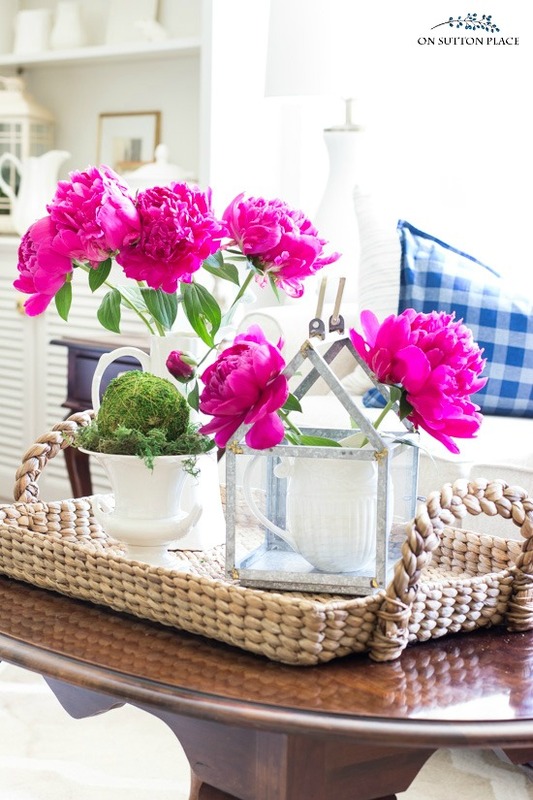 Use these tips & tricks for arranging peonies to easily display this beautiful flower in your home. Includes suggestions for preparation and vessels. It’s peony season…a very short time of year when you can fill your home with blooms that have the power to lift your soul. The only negative thing about these flowers is the fact that they bloom for such a short period of time. Other than that, they are perfection. My peonies were beautiful this season and I thoroughly enjoyed cutting the blooms and bringing them inside. I waited a bit too long to cut them so they didn’t last as long as I would have liked. It’s best to cut peonies when they are still in bud and I missed it this year by a few days. Life got in the way and I just didn’t have a chance to spend any time in the garden. They were almost completely open when I brought them in, but they stayed fresh for almost a week. 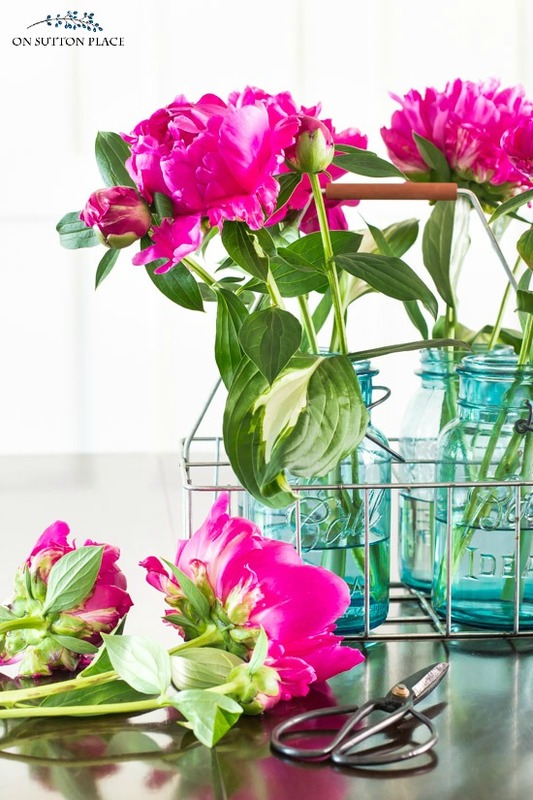 Every flower looks good in a mason jar and peonies are no exception. 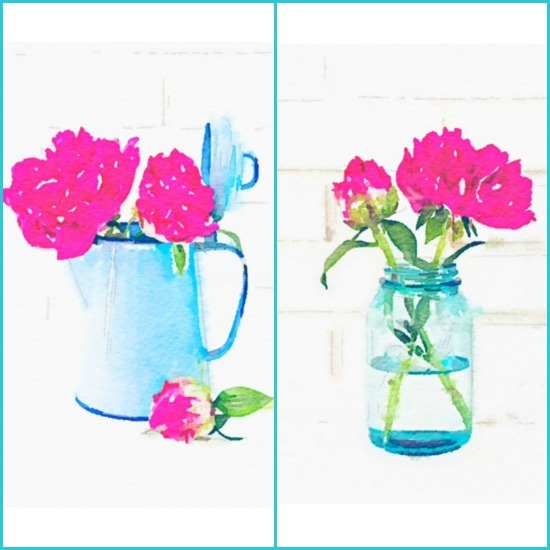 I especially love pink peonies in vintage blue mason jars…but any sort of jar will work. Add hosta leaves and group several jars together to really make a statement. 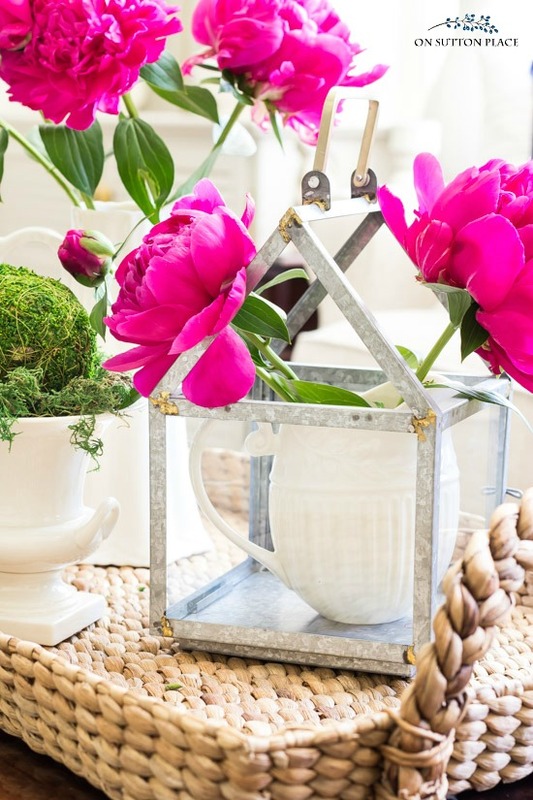 Galvanized metal and peonies are the perfect pair. I filled my galvanized milk cans from Magnolia with tall stems and love the way rustic meets refined. Any kind of galvanized metal containers will work…even small buckets or watering cans. Along with mason jars, pitchers are my go-to vessels for flowers. If you want to start (or add to) an ironstone collection, good places to look are Homegoods and T. J. Maxx. Sometimes you can find them at antique malls or flea markets, but those tend to be a bit pricier. An easy way to make a larger arrangement is to group several small pitchers together. You’ve seen the basket tray on the coffee table before. Trays are perfect for layering and for gathering smaller pieces together. To add a little interest, I used a tall ironstone pitcher, a small urn, and a galvanized lantern with a pitcher inside. Lanterns can’t technically be used as flower vessels, but by placing a pitcher inside a lantern, you can achieve a layered and lovely look. 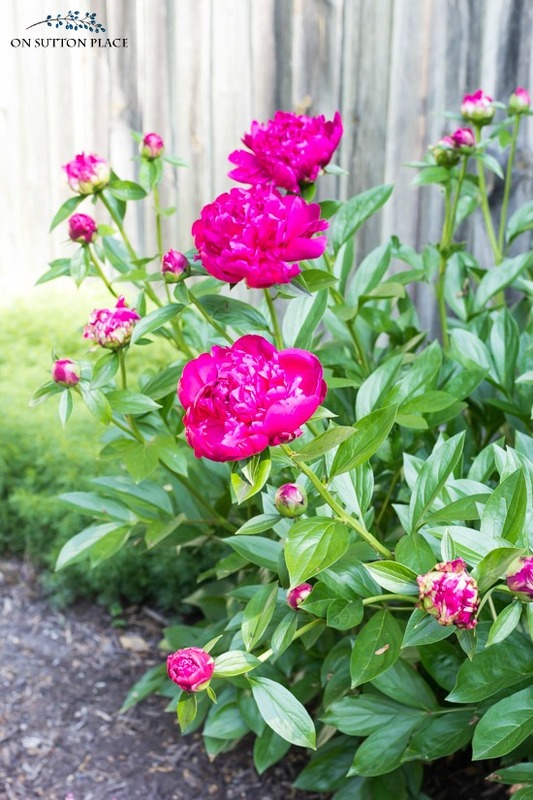 The dark pink peonies pictured in this post are ‘Kansas.’ They were planted about six years ago and it took a few years to get blooms…but it was definitely worth the wait. I also have ‘Krinkled White’ which I shared on my Instagram stories but missed getting any real pictures. They have large white petals and a round yellow center. Maybe next year I can show them to you. I just planted two bushes with light pink blooms called ‘Elk Grove.’ They are very tiny so it may be two years before they bloom. Follow On Sutton Place on Instagram! One thing I did this year which helped keep my bushes upright was trim off all the tiny buds around a bigger bud. This eliminates a stem with five or more blooms at the top. I had this problem last year and most of the peonies were on the ground because the tops were so heavy. Clipping the extra buds did the trick. 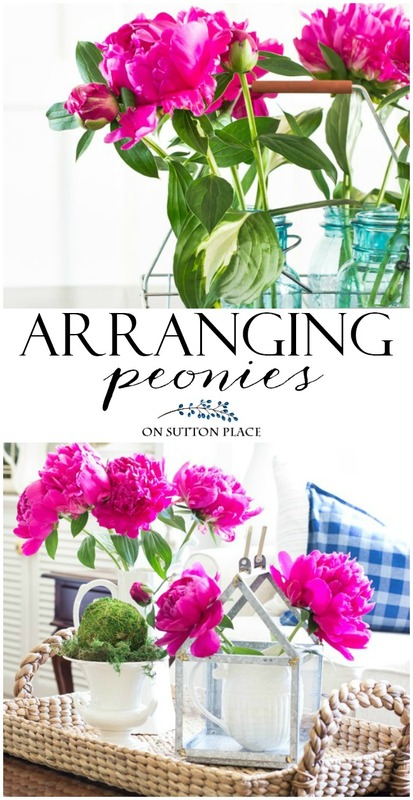 If you have a favorite peony, please share in the comments! Thank you for stopping by…see you soon! the image to learn more! 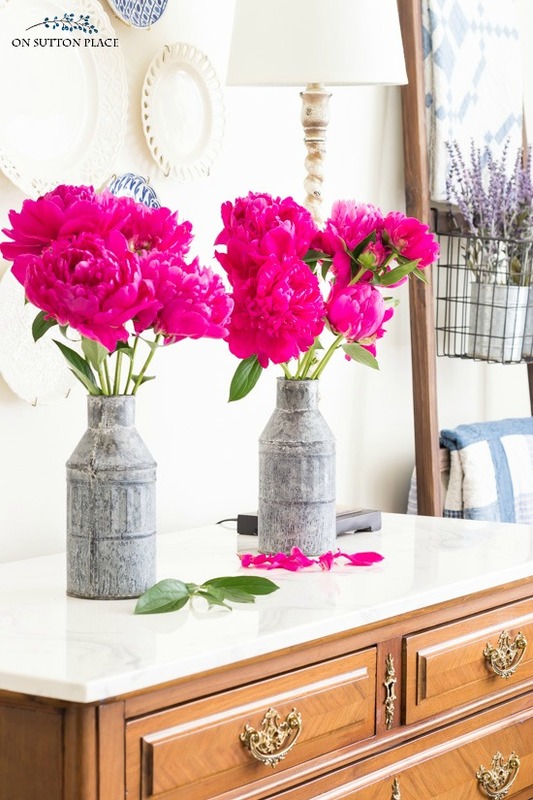 « Home Style Saturdays: Summer Decor, Peonies, Infused Water & More! I also like putting one peony floating in side a glass round vase, looks like a water Lily floating and it’s great for smaller bushes that don’t produce many blooms yet. Hi Anne…I too love peonies! Is it true that soil can affect the color of the blooms over time? Thus a deeper pink or red peonie may turn lighter pink because of the type of soil they are grown in. Beautiful Anne. I have the same color in my garden. Your tips are well appreciated. Can I ask, how do you manage the bushes after the blooms have gone? Thank you! I love your blog. Thanks for all the info on Peonies. Peonies are my favorite flower. Mine are starting to bloom. I love bringing them inside, but i do worry about bringing ants in also. Hopefully a good shake will knock them off. I think will try your idea of adding the hosta leaves to the blue canning jars along with the peonies. I also love peonies, but I am not alone. The ants do too! Do you have any tricks on how not to bring them into the house? I try to rinse them but the little buggers sneak in. But I guess the peonies are worth it. I added a yellow peony about 4 years ago and it is spectacular ! I have 5 pinks and whites from my parents house. I moved them before the house sold. They can live 75 years. Love them so. I got my peony about the same time we got our mini Schnauzer puppy, Mocha (AKA Boo Boo). After I planted it, she tore off the 3 blooms & was playing with them in the yard. Oh well, I thought. Then she ripped off all the leaves. Oh dear, I thought. Then she chewed off all the branches down to the ground (you’d think I would have learned not to leave her alone). I figured that was the end of the peony. But it’s come back every year, and blooms beautifully! We lost our Boo Boo 2 years ago. I always think about that when my peony blooms. Makes me smile! I love the bud trimming idea. I also cage mine in tomato cages…adds a lot of support. 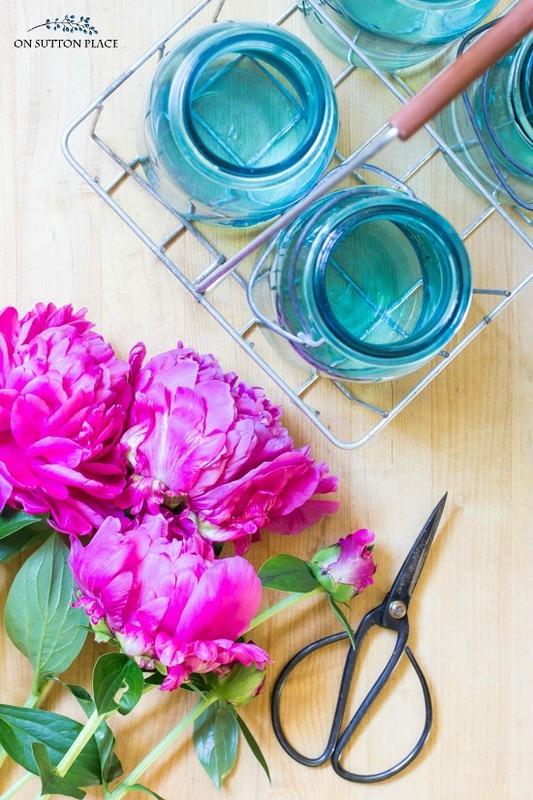 If you put cut peonies into a dry vase ,they will dry perfectly .This works well for hydrangeas as well. Such a beautiful flower and they look lovely in all the containers, enjoy. I love to put my peonies in my ironstone and milkglass vases. I have the dark pink peonies, as well as light pink and white. I agree that they are perfection. Mine haven’t begun to bloom yet. We are in the Pacific NW; I think it’s the only cool place in the nation right now! I’m from Florida and never had the pure joy of growing these gorgeous flowers. This is the first year here in NC they have really popped. I am in awe of this amazing flower. My new favorite! Thank you for those amazing ideas for displaying them. Loved your post,one of my favourite flowers. Brought back memories of the peonies I grew in our garden at the cottage. Hi Ann! Your peonies look great! Mine are just starting to bloom. One thing that would help with keeping them upright is a peony ring. It is easiest to use before they get too big. Just center it over the plant in the spring. It holds the blooms more upright. You can find them at most garden centers. My peonies are gorgeous this year. They were my father’s favorite flower in his garden. When they bloom every year in my garden it brings back sweet memories sitting on the back porch of my parents’ house looking out at his garden. Thank you for the post today. Your photos are beautiful. Cut my white peonies at 6 am this morning and have them in a blue canning jar that was my grandmother’s. How fun to see these ideas from you, Ann.